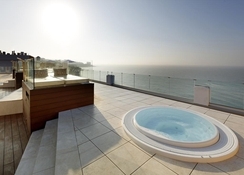 The trendy 4-Star Palladium Hotel Costa del Sol is located in a quieter coastal area, away from the bustling main resort centre of Benalmadena. In an elevated location with stunning sea views and a small beach in front of the hotel with plenty of facilities, the Palladium Hotel Costa del Sol (Formerly the hotel PlayaBonita) provides the perfect choice for the whole family. 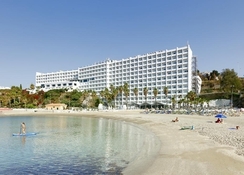 The hotel’s fabulous facilities are being renovated throughout the winter of 2018/2019, forthcoming highlights include an outdoor themed swimming pool with slides and whirlpool, with a spacious area for sunbathing, a sky lounge offering magnificent views of the Mediterranean and three restaurants offering different cuisine for all the family. 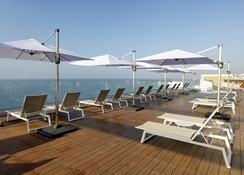 With its beachfront location, the Palladium hotel Costa del Sol sits in an elevated position, south of the main resort centre of Benalmadena, roughly a 25-minute drive from Malaga Airport. There are various attraction’s all within a 20-minute walk away, including the Butterfly park of Benalmadena, as well as both the casino and golf of Torrequebrada. There are various room types at the Palladium Hotel Costa del Sol, all 336 rooms offer fine living standards and boast a private bathroom with amenities including a hairdryer, satellite TV, telephone, minibar, air conditioning/heating and ceiling fan, safety deposit box (extra charge) and a balcony or terrace. Standard Deluxe Rooms sleep up to three guests and the Deluxe Superior Rooms come with an additional double sofa bed in the connecting lounge - which can sleep a maximum of four guests. 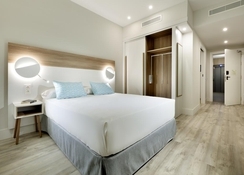 There are also several Junior Suites that also sleep a maximum of four guests, but offer more comfortable and spacious living with four individual beds fitted with memory foam mattresses. The three different on-site restaurants all offer buffet-style show cooking with a variety International and local cuisines available. 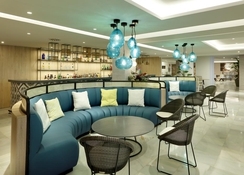 There are several bars as well as the pool side snack bar offering refreshments throughout the day. Note: During evening dinner it is compulsory that mean wear long trousers. 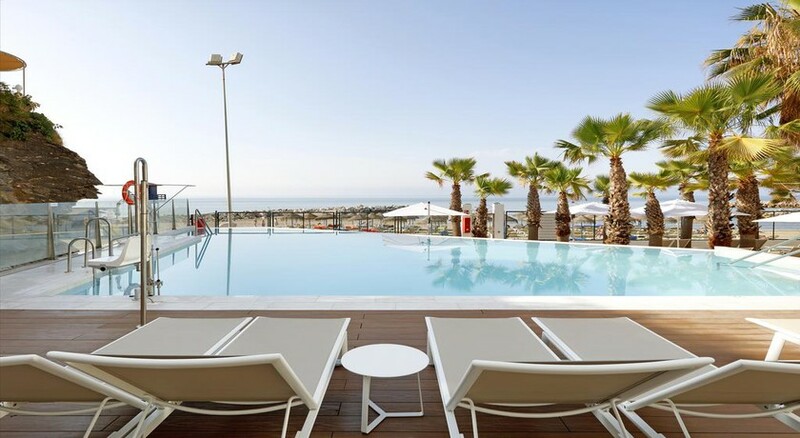 The Palladium Hotel Costa del Sol has an abundance of facilities to offer its guests, these include the main outdoor themed swimming pool with water-slides and a whirlpool surrounded by palm trees and ample space for sunbathing. There is also a separate children’s swimming pool and the indoor swimming pool with additional whirlpool (heated from October to May), the hotel also offers complimentary pool towels and sunbed hire. Away from the water, the hotel provides daytime and evening entertainment’s programme and for the younger guests there is a children’s mini club (open June – September). For adult indulgence and relaxation, we’re sure that you will enjoy the tempting spa and enjoy exclusive treatments and facilities such as the steam room, sauna and jacuzzi. Lovely staff and views. Restaurant was great, and had fresh meat cooking daily in front of you, which is very rare in all inclusives I have stayed in the past. Beautiful beach and easy access to get to, great hotel to stay in, if you plan to stay mainly in the hotel. The only down side it is not so near to town, so you need to take a bus or taxi, and the busses was very often full and ran every 1/2hr, and if they are full this is a pain. My daughters name is Bonita so I booked this as a punt!! so, so impressive a stay for such reasonable price! Food was fabulous, rooms great and right on the beach! Entertainment good and kids club fantastic! Had a fabulous holiday. Staff were excellent. Very welcoming and friendly. I know a bit of broken Spanish, so had a few giggles with the waiters. Rooms were clean, and maids were daily, all sea view. Location to the beach is fantastic, although a little far out of town. Buses were plentiful, and seemed to be on time. A few nice bars and a supermarket just down the road. Hotel food was good. Facilities were excellent too. Pool very clean. Would recommend.